Just like Untappd, Beer Hunt for iOS combines the best parts of a night out drinking beer with the best parts of Foursquare. The difference here, though, is that Beer Hunt turns all into one colossal social, brew-drinking, liver-killing experience. 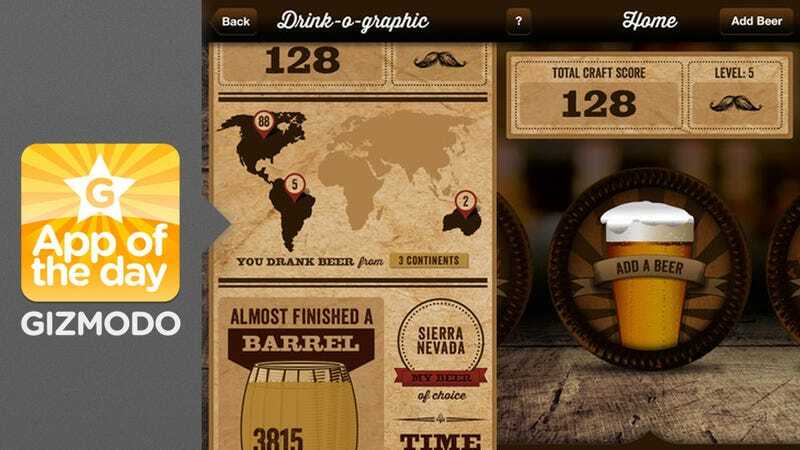 Lets you "check-in" with every beer you drink. Points and badges are earned for everything from the beer's style to its geographic origins to its rarity. All this data gets compiled into a drink-o-graph that helps you keep track of your total or history (or more likely, the night before). The best part, you and your friends can compete to see who can get the biggest Craft Score. Warning: the winner in this case is also probably going to lose in a very different way. Namely consciousness. The general concept isn't new, sure, but it's never been done in a way quite this fun. You don't just get the typical stats of total monthly intake, most popular types of beer, etc. ; you'll also get to see your own personal "beer o'clock," which is the time of you most often take to the bottle. And while most people don't necessarily need a reason to toss back a few cold ones, everyone enjoys a little competition. With a strong group of beer enthusiasts at hand, you can add a little something special to an otherwise uninspired routine.